The author worked in Burma's wartime ICS and in its run-up to Independence. 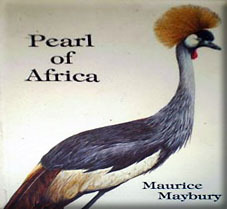 After a stint in the Conservative Research Department, where he aspired to become an M.P., he spent the fifties in Uganda, which Churchill, years earlier, had called the "Pearl of Africa". He left 3 years before Independence, and subsequently lost touch with events. His short bibliography reflects the limits of the book, much of which echoes Kampala European Club / Freemason Lodge opinion of that era. But after all, it was not fashionable then to hob-nob with Africans, so he was cut off from those he was appointed to serve. He began as Director of Supplies in a Uganda beset by a legacy of wartime controls and shortages and finished as a principal adviser to a newly appointed Minister. In the mainstream administration he would have rubbed shoulders with Africans rather than leading Asians, which should, no doubt have tempered the disparaging, reactionary observations about them. Against the stream he recognised and respected the insights and brilliance of Andrew Cohen's exceptional 5 years' governorship. The account is an honest and authentic, albeit shallow, reflection of the period. It is therefore often embarrassing. There is much domestic trivia, and not enough about the fields for which the author was responsible. What is provided is largely superficial, and fails to measure up to the opinion reported that the author's report on African Trade was "one of the greatest contributions to colonial history in Africa". Asian traders are dynamic: Africans are "lackadaisical" and "indolent". The free market is O.K. for Asians but Africans need public intervention. Asians can wholesale: Africans will retail. The Madhvani empire is an Asian triumph "using normally ineffective African labour". There are inaccuracies (including spelling), and frequently the author is out of his depth, but he did not have access to the standard works. Despite its shortcomings this book provides compulsive reading for old Uganda hands. It is a period piece that will shed light for future historians. For many it provides a nostalgic reminder of the world as they knew it. It helps to explain in its own way the human limitations of our colonial legacy.